Tinder describes itself as a location-based social search app. It isn’t. It’s a dating app. And it is the dating app which has changed the way millions of people meet new people. Instead of the old-fashioned dating apps that used algorithms to match you with potential partners, Tinder leaves the decision down to you. But some of you are missing out on this dating revolution because you are finding that Tinder is blocked. Never fear! There is a simple tool that can unblock Tinder no matter where you are. It’s called a VPN, and in this article, we are going to tell you everything you need to know about it. With more than 50 million paid-up subscribers around the world, Tinder is the go-to place for just about anyone looking for a partner online. Over the years, it has put together many happy couples. Who could possibly have a problem with that? Well, the answer is quite a few people it seems. Some conservative countries like the UAE, Indonesia, and Oman, where the concept of love and dating is often seen as sinful, have blocked access to Tinder altogether. If you try to access the site in these countries, you will be met with an error message. Tinder also directly connects to your Facebook account, so if Facebook is blocked in your country, you can encounter problems accessing Tinder too. The other place where Tinder can also be blocked is in workplaces, universities, schools and other closed environments where people are supposed to be focused on altogether different matters. If you need help unblocking Tinder, or if you just like to search for potential matches in different geographical areas, this article has everything you need to know about the easiest solution; a VPN. A VPN is a simple online security and privacy tool. It works by redirecting all of your internet data down a secure tunnel and through an external server, where it is tagged with a different IP Address, before being sent to its intended destination. This not only enables you to unblock Tinder, but also keeps your online activity secure. No-one can see what internet sites you are using. We have tested all the biggest VPNs with Tinder around the world and identified our top three VPNs to unblock Tinder. If using a VPN sounds complicated, don’t worry. It really isn’t. The process of setting up a VPN to unblock Tinder is really straightforward as you will see in this example, using ExpressVPN. Firstly, head over to the ExpressVPN website and sign up for their service. 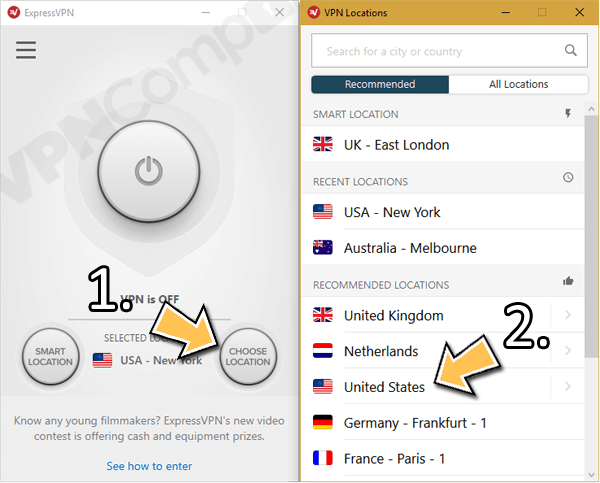 Then, you will need to visit the Products section of their website and download the correct ExpressVPN app for your device. Once this is installed open it up and log-in using your new account details. You now need to connect to a server outside your own country, simply click Choose Location (1), click on a country where Tinder isn’t blocked and then click Connect (3). Unblock Tinder by connecting to another country on ExpressVPN. That’s it. ExpressVPN will take a few moments to establish a connection and hey-presto, Tinder is unblocked! Is using a VPN with Tinder safe? If using Tinder is illegal in your country, it is reasonable to question how safe it is to use a VPN to access it. The simple answer is, extremely safe. Because a VPN encryptions all of your internet traffic, it is impossible for any prying eyes to see what you are doing online. No matter how hard they look. Even your own ISP cannot see what is inside your data. It can only see that you are connecting to your VPN’s servers. As soon as your data is tagged with a different IP Address it becomes invisible to them and they have no idea which websites it is winging its way towards. As long as your device is secure, a VPN will make your internet connection secure too. In this scenario, there is absolutely no risk using a VPN to unblock Tinder from anywhere in the world. Everyone loves Tinder. Well, almost everyone. If you happen to live in a country where Tinder is frowned upon and blocked, or just want to browse dates in a different geographic area, a VPN is the answer. Grab yourself a VPN such as ExpressVPN or one of the others recommended in this guide and unblock Tinder in any country. So, don’t let the censors ruin your chance at finding love and happiness. Use a VPN to get onto Tinder today and join millions of other who are searching for that special someone. I would love to know what country you’re swiping right in. Pop a comment in the section below and let me know.